If you are in need of Healing Physically, Emotionally or Spiritually energy wise Check out Energy Healer Callie Amiday in Minneapolis. Over the next several posts I will provide an in depth explanation of how Intuitive Healing works as well as other holistic healing modalities. First let’s review a few major concepts. We learned way back in elementary school that every thing in the universe is made up of atoms. But what are atoms? Atoms are mostly empty space. 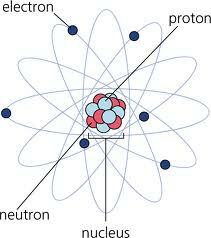 In elementary school we learned that protons and neutrons make up the center of the atom which is called the nucleus. Orbiting the the nucleus are electrons. Drawn to scale. If the protons and neutrons were a centimeter in diameter. The electrons would be less than the diameter of a hair. The entire atom’s diameter would be greater than the length of 30 football fields! Another mental picture. If an atom were as large as a football stadium, the nucleus would be the size of a small ladybug crawling across the 50-yard line. In spite of this size difference, virtually all of the mass of an atom is concentrated in its nucleus. One electron, which has a negative charge, weighs only 1/1836 as much as the lightest of all nuclei, that of the hydrogen atom (proton). What is between the nucleus and the electrons? Empty Space! Therefore most of the universe it empty space. Actual physical matter is only a fraction of the universe. The rest is energy in other forms both within our capacity to comprehend as well as outside of it. These other forms are, light, thought, vibration, and feeling to name a few. Whole body treatments including our hydrating exfoliating wrap and Raindrop Treatment.